First to poach the pears. I simmered them in a cinnamon citrus syrup until tender. 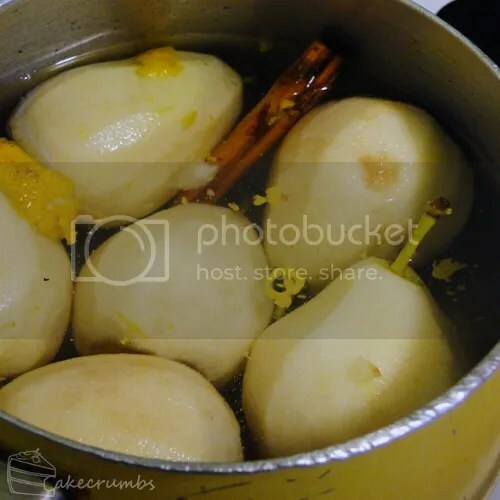 The pears have to cool in the sypur, so get these started well before you start the cake batter. Once they're done, drain them completely on paper towel. While they're draining, you can preheat your oven, line your cake tins and get started making the cake batter. By the time you're finished doing that, the pears should be ready to incorporate into the batter. 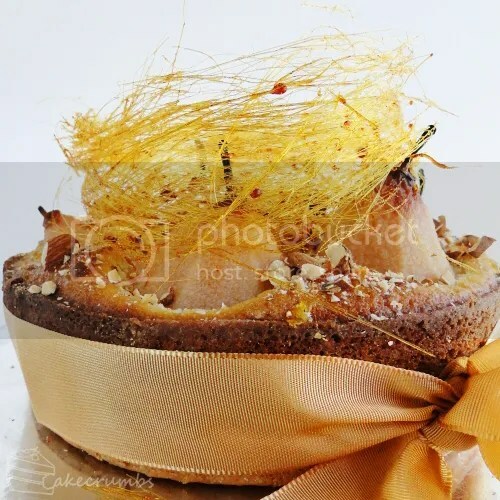 The cake is trimmed in gold ribbon to hide the join, but in consists of two layers joined with an apricot glaze. 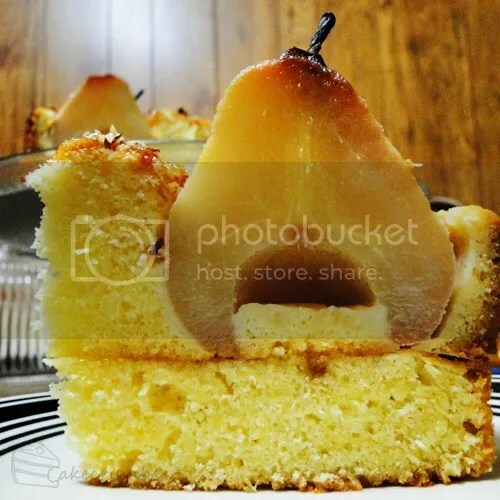 Only the top layer has the pears baked into it, so you just see the tops of the pears poking out the top. 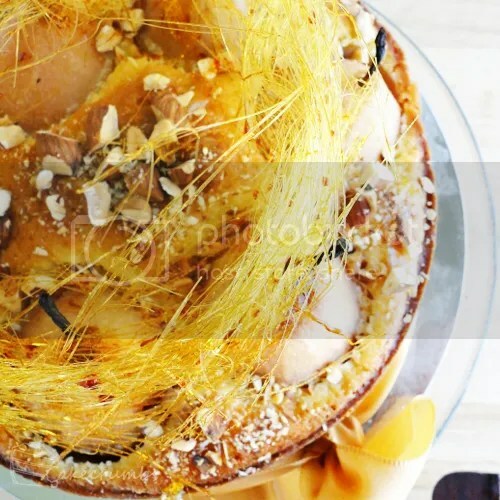 The cake is topped with a golden halo of spun sugar. 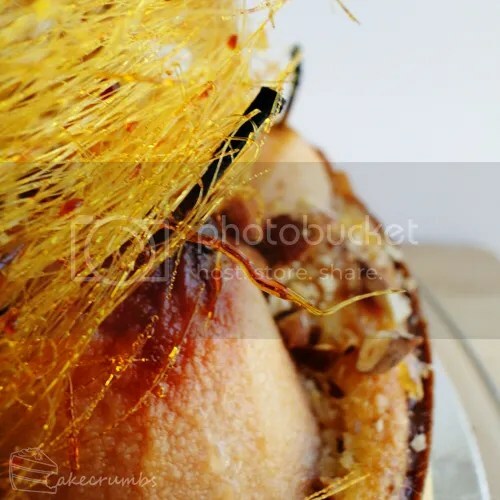 Under the sugar, the top of the madiera sponge is brushed with the apricot glaze and sprinkled with roasted almonds. Combine sugar, cinnamon and lemon rind with a litre of water in a saucepan large enough to fit all 6 pears. Stir over medium heat until the sugar has dissolved and bring to the boil. Reduce syrup to a simmer. Meanwhile, core the pears using a melon baller, peel, then place in the syrup. Simmer for 10 minutes, or until pears are tender (this will depend on how ripe your pears are to begin with). Allow to cool in the syrup. Drain completely on paper towels. Preheat oven to 180°C (160°C fan-forced/350°F) and grease or line two 23cm round cake tins. Make the cake batter; cream the butter and sugar until light and fluffy; beat in the eggs one at a time, beating well after each addition. Fold in the sifted flours, then stir in the milk. 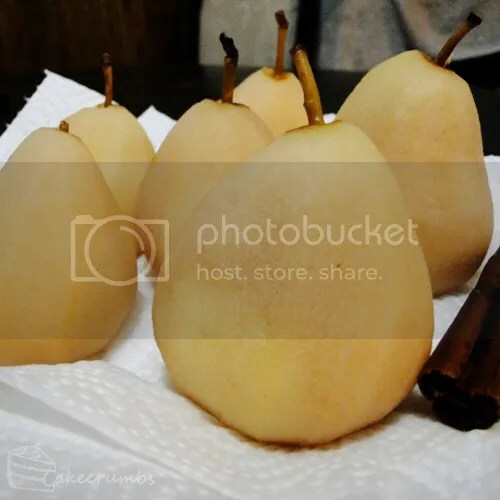 Divide the cake batter between your cake tins; arrange all 6 pears inside one of these tins (use a springform tin for the pear later if possible). Bake cakes for 40 minutes; remove the plain layer and continue baking the pear layer for another 35-40 minutes. Leave cakes to cool inside their tins for 10 minutes before removing. Trim any domes off the top of the plain layer and place onto a serving dish. Heat the apricot jam in a saucepan and strain through a sieve. Brush 2/3s of the apricot glaze into the top of the plain layer; place the pear layer on top. Brush the remaining glaze over the top of the pear layer; sprinkle with almonds. If making the spun sugar halo, place a wooden spoon on your work surface with the handle protruding over the edge. Weigh it down so it doesn't move, then arrange some old newspapers or magazines on the floor underneath. Heat the white sugar and 1/4 cup of water in a small, heavy-based saucepan. Stir until sugar has dissolved, then leave to boil without stirring. Once the toffee has reached a lovely golden colour, remove from heat and dunk in a large bowl-full or sink-full of cold water to stop the cooking process. Wait until the bubbles have subsided and toffee has cooled very slightly. Dip a fork into the toffee and wave it back and forth over the wooden spoon handle. 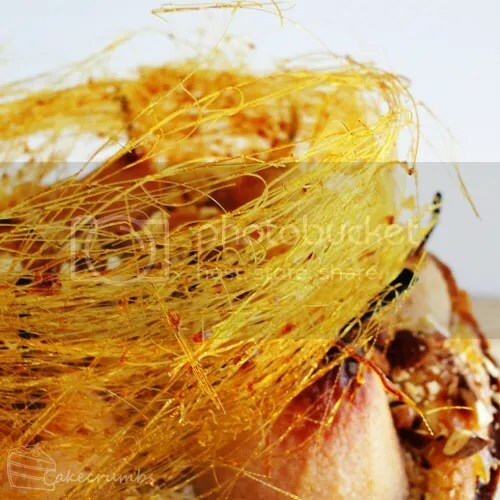 Once you've created enough strands, gather them off of the spoon and arrange them in a halo shape on top of the cake. The toffee with soften relatively soon after being arranged on the cake, so do this soon before serving. You certainly know how to make a cake with the wow factor! I am a big fan of your spun sugar creations too. The way you do it is not too crafted but not too rustic either, if that makes sense. How did it taste?